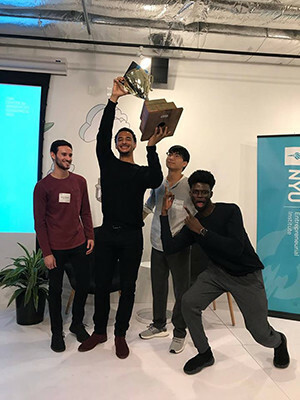 On July 12, Victor Hunt ’18 and cofounders Aaron Resnick ’18 B.S., Matt Kim, and Yusuf Olokoba, took home the grand prize at the NYU-Yale Pitchoff for their startup, Astorian, an online marketplace for building owners and contractors to submit projects and bids. The pitchoff is an annual event hosted at New York University in collaboration with the Tsai Center for Innovative Thinking at Yale (CITY) and the NYU Entrepreneurial Institute. The event pits three teams from each summer accelerator against one another in a friendly competition. The Astorian team is now living and working on the business full-time in New York City and has reached over $22 million in bids. Hunt was drawn to real estate from a young age. He was raised by his mom in New York City and says there were times when he didn’t have a secure home. In middle school, he found work and mentorship with the CEO of a 38-building housing complex, where he learned the ins and outs of the business and saw the need to connect building managers with vetted contractors quickly and efficiently. When building managers sign on to Astorian, they also provide their network of contractors. The site adds these to a growing database of licensed contractors who must upload their licenses and referrals, all of which is verified. After a job is done, both sides are invited to rate the experience. “Our vision is for the platform to be as automated as possible,” Hunt says. Other features of Astorian include scheduling, site visits and side-by-side bid comparisons. Resnick, who roomed with Hunt for four years at Yale, is also passionate about entrepreneurship. “I like being able to drive the growth of something and be exposed to so many different aspects of the business,” he says. Hunt worked at the private equity real estate firm Dune Capital where he received guidance from co-CEO Dan Niedich ’72 B.A. “I saw an overview of real estate there that complemented my grassroots approach to industry,” he says. They attracted WinnResidential — a major New York City property manager — which brought 300 buildings onto their platform. The Astorian team has spent the past year traveling to as many pitch competitions as their schedules would allow, including ones at the Massachusetts Institute of Technology, University of Pennsylvania, Harvard, Rice, Carnegie-Mellon, and Princeton. They won business plan competitions in Connecticut, Queens County, and Brooklyn and were finalists at several others. At Yale, they honed their skills through entrepreneurship courses at School of Management by lecturer Maureen Burke and Kyle Jensen, associate dean and the Shanna and Eric Bass Director of Entrepreneurship. They spent the past summer participating in an eight-week Summer Fellowship at Tsai CITY. The cofounders say that with all the support and experience their pitch has improved tremendously, and with it, the interest of investors. Astorian has raised a pre-seed round and are continuing to bring more buildings on board. Their makeshift office is at the Yale Club of New York City.